TORONTO (AP) — Jonathan Osorio scored in the 76th minute, lifting Toronto FC to a 2-2 tie with the Chicago Fire on Saturday. Toronto (3-0-1) was the only MLS team with a perfect record coming into the day. It extended its undefeated streak against Chicago to 10 dating to Sept. 26, 2015. 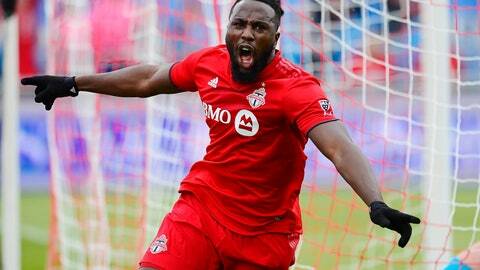 Jozy Altidore scored for Toronto in the first half and set up Osorio’s tying score. Positioned on the flank near the Chicago penalty box, the burly striker twisted and turned Jeremiah Gutjahr before delivering a perfect cross for Osorio to head in. C.J. Sapong and Nemanja Nikolic scored for Chicago (1-2-2) before 26,256 at BMO Field. Spanish playmaker Alejandro Pozuelo, who dazzled in his MLS debut last week with two goals and an assist, set up Altidore’s goal in the 31st minute. He made a perfect cross to the American, who headed it in at the far post for his third of the season. Chicago drew even in first-half stoppage time after Gutjahr’s long ball found Sapong, who held off Chris Mavinga and then beat goalkeeper Alex Bono. A Toronto giveaway set the scene for Chicago’s go-ahead goal in the 62nd minute. Richie Laryea lost the ball in midfield and Aleksandar Katai raced through the area where the Toronto fullback was supposed to be. With no one closing him down, he headed toward the penalty box and sent in a cross that Nikolic tapped in as Toronto defenders watched.